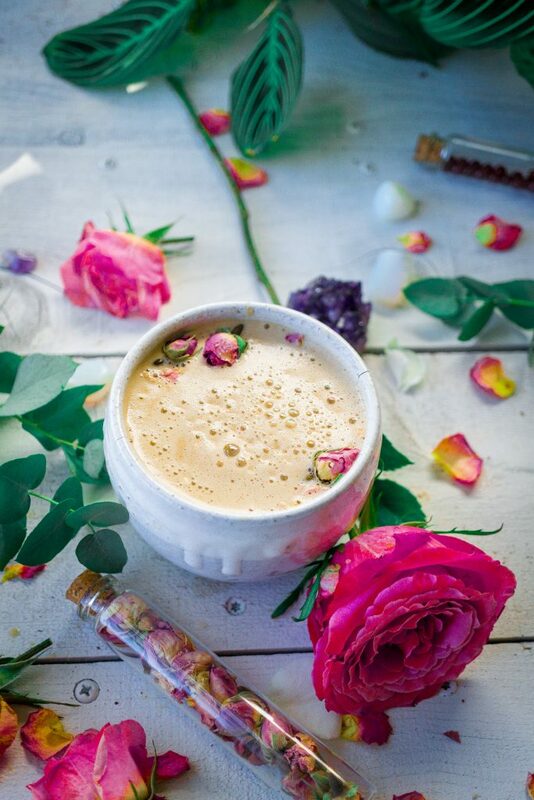 Rose Cacao Herbal Coffee Love Latte is the perfect way to romance yourself or your lover. This recipe has been our go-to recipe since we got our hands on Rasa. It tastes just like coffee, & a cappuccino to me. Dan, my love is the most obsessed with coffee, so now I feel like I have a routine besides matcha to go to. 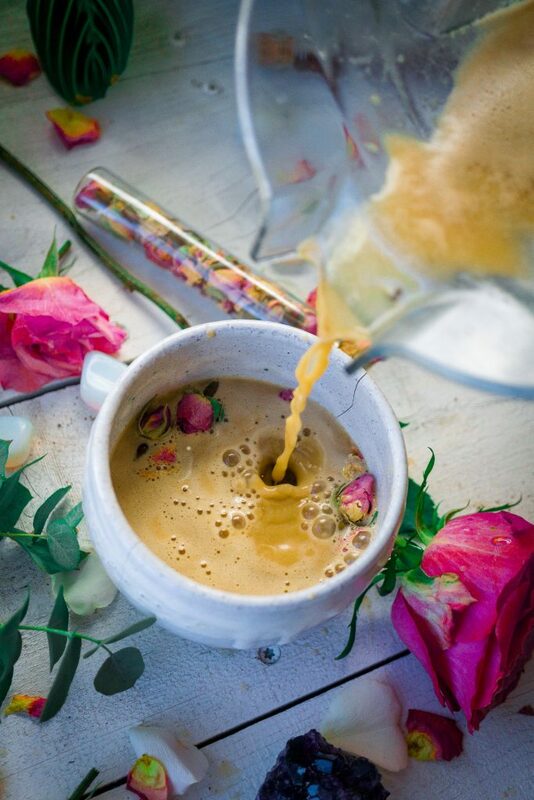 This recipe is frothy, coffee, like and adds in the aphrodisiac, & heart opening qualities from the cacao Rasa blend. So, let me say, if you haven’t watched my most recent stories on Instagram, you might not know how obsessed I am with Rasa’s blends of coffee. Before I even begin, I want to state I am not getting paid to praise Rasa, it’s truly coming from the heart. However, their coffee blends are amazing! 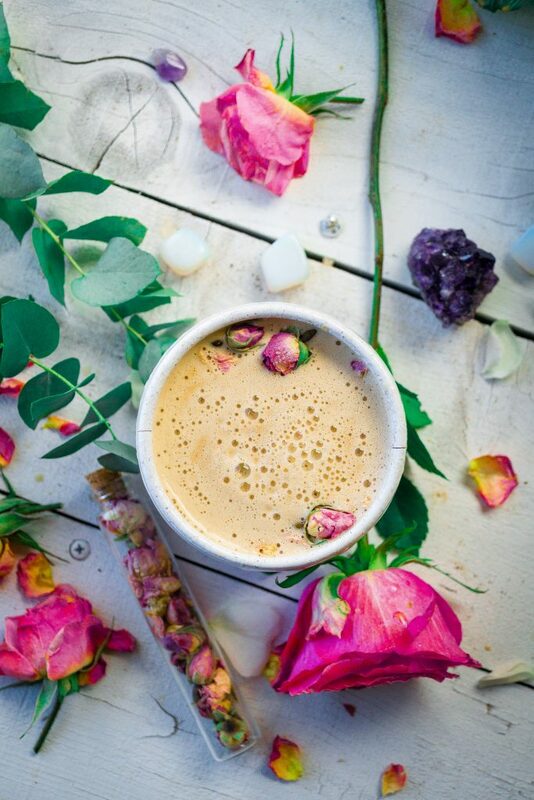 They are packed with healthy adaptogens and delicious flavor that can be the base to transform a latte to be magical! 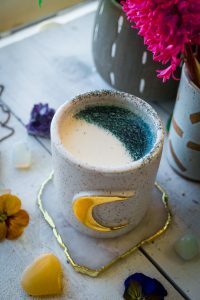 I get a lot of questions regarding adaptogens like, “I want to start using them, where do I begin?” Or “Dannng, these are expensive and there are so many, what do I do?”. Well, Rasa provides a solution. 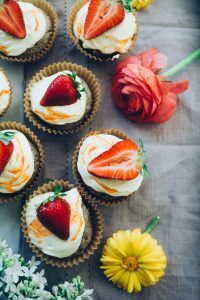 Besides the intimidation of where to start and the mental complexity, you are recommended to take adaptogens regularly to get the full effect. That’s where the beauty of Rasa’s Coffee blends come in! 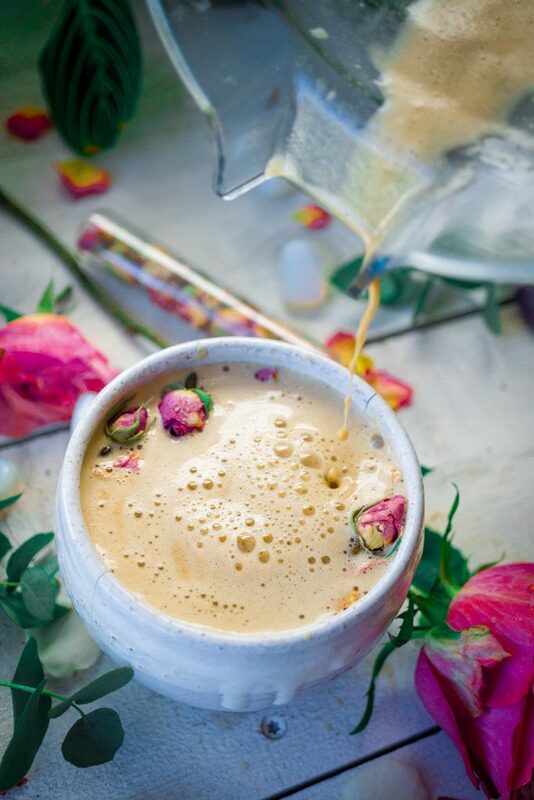 All the main adaptogens are included in the blends and it is super easy to make and taste delicious! This is right where I’d begin a health journey that includes adaptogens. Not only is it all included, you can add it right to your daily coffee ritual or possibly even REPLACE regular coffee with a Rasa blend (don’t tell Dan, my love, he’s a coffee enthusiast, but he LOVES Rasa). You will then get your daily adaptogens and start feeling the positive benefits right away. 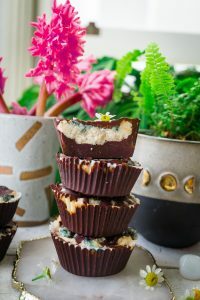 They even have a “Dirty Rasa” which contains just a bit of coffee along with energizing herbs and adaptogens. If you are like me and are sensitive to caffeine, you can use a normal Rasa blend, but if you want a kick, they have options for that as well! 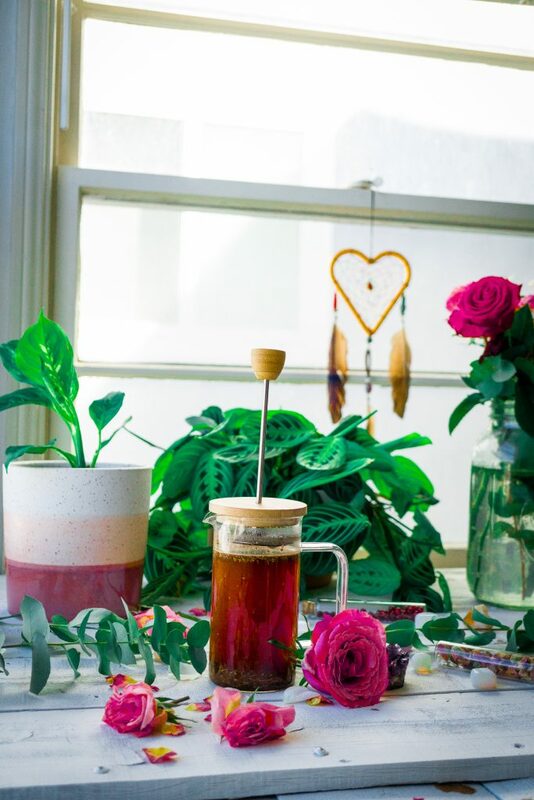 The best part is you don’t have to buy a million separate jars of adaptogens, or if you are like me and love to travel with your million jars of adaptogens. After discovering Rasa, I felt called to become an affiliate. I only become an affiliate for products I truly care about, and because I get to share a discount code with all of you. Not only is their product absolutely amazing, but I have also been in contact with them and their ethics and undying love for the planet and sustainability is truly a blessing and so inspiring. They are also 100% women-owned and focused on empowering women in business. The icing on the cake too is once you are finished and used a full bag of Rasa, the bag is 100% compostable. Add roses on top and let steep for 1-2 minutes. Strain rose petals out before drinking.